The third floor of the museum was once the ice house for the fish processing plant and today is the location of the museums Ice House Theatre. 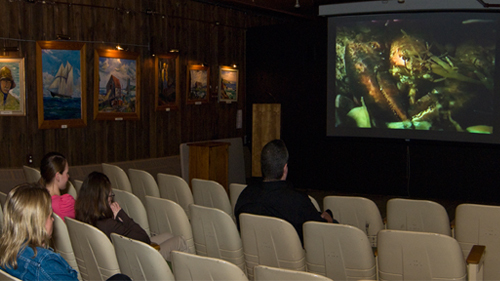 From 9:30 a.m. to 12:30 p.m. the theatre shows the following films that covers a host of topics. Bluenose in the Sun – The story of Bluenose ll. Sea Got In Your Blood – A history of the famous Bluenose and the construction of Bluenose ll. Puffins – Land and Sea production investigating the secret life of puffins in the Bay of Fundy. Worlds under Water – The life and times of lobsters in the wild. The Stow Away – A Lunenburg schooner leaves for the Grand Banks with a young stow away aboard. Rum Running – Land and Sea production, showing our local ties to the rum trade during Prohibition. Where the Bay Becomes the Sea – The food chain and marine life of the Bay of Fundy.